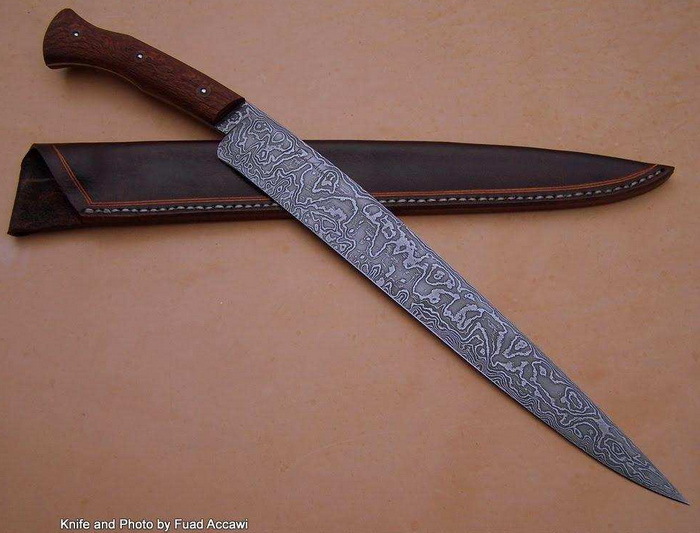 ABS Journeyman Bladesmith and Forged in Fire contestant Fuad Accawi has forged a wicked Persian style Fighter with an 11.5-inch random pattern Damascus blade. It is 16.5 inches overall with sandblasted Snakewood handles on the tapered tang. for the British Army. They both died young and none of us ever had a chance to meet. in junior high school. My dad was cleaning out junk from a storehouse in our back yard & gave me a coffee can full of dull files, and an old homemade bench grinder. I was grinding objects that could be mistaken for knives & within a few hours I was hooked on steel for life. Over the years I’ve held several jobs. I apprenticed in college to a jeweler and within a few years I was an accomplished bench jeweler with several trainees under me. Next I moved on to machine work. I apprenticed in a well stocked manual machine shop with lots of good guidance from talented old school machinists. I stayed in machine work for 12 more years and worked for some big companies like Panasonic and General Pattern working on my knives after hours. I was a strict production style knife guy back then. Every job I’ve ever taken, except plumbing, has been one that can help me advance my skills as a knifemaker. I got into forging and making my own Damascus Steel about 14 years ago and it took me to a whole new level of obsession. Since then I’ve been concentrating on making my work the very best possible. My in house heat treating experience has come into play in earnest, and it’s amazing to know that I can make that piece of steel I forged out do anything I want all the way down to the grain structure. I’ve been making knives full- time for 14 years, but as a passion for over 30 years. I’ve been published numerous times, I’ve done many forging & finishing demo’s, recently for University of Tennessee’s department of Material Science, and several TV pilots that were never picked up. Also an appearance on History’s “How Stuff Works-Steel”. And of course, Forged in Fire.